Join over 200 8th-12th graders from Maryland, Virginia, North Carolina, and Washington D.C. at CAMP LOUISE in Cascade, MD, May 25-28, 2018! You won’t want to miss a weekend full of fun & new friends! 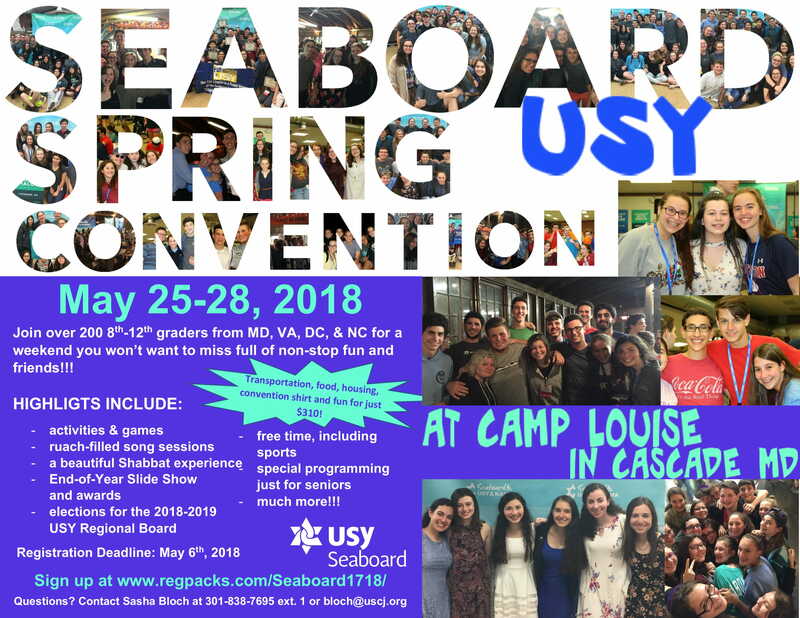 Highlights include: a weekend full of non-stop FUN with AMAZING and EXCITING activities and games, ruach-filled song sessions, a beautiful Shabbat experience, movie night, sports, a dance, a community service project, the USY End-of-Year Slide Show and awards, elections for the 2018-2019 USY Regional Board, free time, special programming just for Seniors, and more!! Click here to see the pictures from last year’s USY Spring Convention! Click here to download the required Camps Airy and Louise Rental Group Waiver. Registration is now open at www.regpacks.com/Seaboard1718/.